The Gallery renovations were designed by the London based architectural studio McInnes Usher McKnight Architects (MUMA). The Landscape & Sustainability Technician and Art Garden volunteers manage and maintain the gardens. Jo Malone London provide sponsorship and monthly staff volunteers to support the landscape programme. Founded in 1889 as the first English gallery in a park, the Whitworth is celebrated for its eclectic exhibitions of contemporary Fine Art, British watercolours, textiles and wallpapers. In 2015 a 15 million pound development transformed the gallery, doubling it in size and creating space for three new gardens. The largest is the Art Garden formed by two new wings that project from the back of the building as if embracing the adjoining Whitworth Park. The landscape needed to respond to the monumental scale of the architecture whilst also offering a more intimate sense of scale that would welcome visitors in from the park. With this in mind, the garden was designed as a multi-layered, vertical, composition: Tall, multi-stem trees; Ostrya carpinifolia, were planted to grow upwards and greet the glass structure of the new cafe wing, making it appear to float in a sea of green leaves. At ground level, the Ostrya’s strong, upright stems frame views from the interior across the garden. Cloudy box hedging escapes the confines of the perennial borders, interrupting the symmetry of the Art Garden's central ‘Sculpture lawn’. This evergreen hedging forms abstract patterns across the whole of the garden space, signalling pathways through plantings and creating ‘secretive’ nooks for small gatherings. The undulating patterns of box anchor the garden through the seasons contrasting with low spring bulbs and later with towering summer perennials: Eupatoriums, Aster umbellatus, Sanguisorbas and Molinia grasses. Towards the outskirts of the garden, the plantings become lower and less structured grading into newly established native meadow. 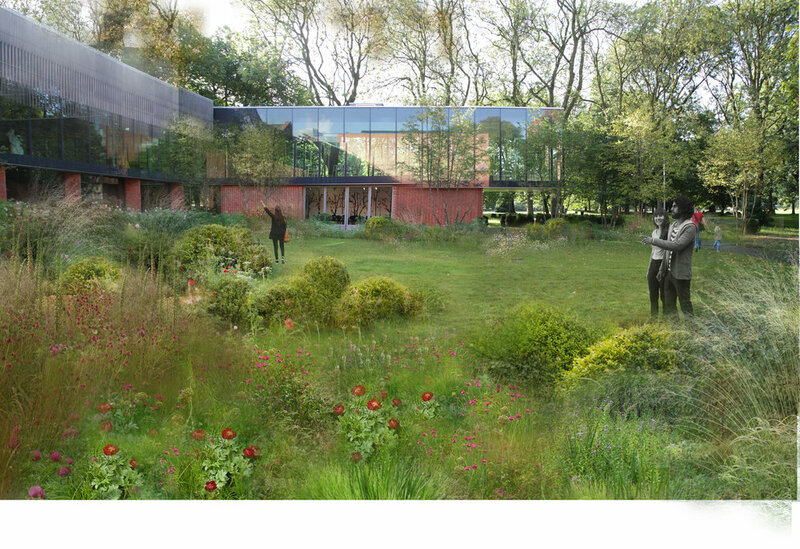 This creates a further link between the gallery, garden and parkland setting.